I grew up as a Yes fanatic from the age of 12. 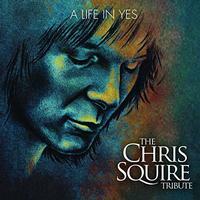 As a bass player myself, Chris Squire was a huge part of my own growth as a musician. I know that Billy Sherwood had very similar beginnings in that regard. Sherwood later became close friends with Squire and worked with him in a number of musical projects. For that reason, I can't imagine anyone else doing this set as well as Sherwood has. Normally I wouldn't include a set like this in my "best of" list for the year. This one is so compelling, and so strong, though, that I really had to put it in as a last minute addition. The cast of musicians assembled here is stunning from Jon Davison to Patrick Moraz, Steve Hogarth, Steve Hackett, Todd Rundgren, Tony Kaye, Nikki Squire, Dweezil Zappa, Sonja Kristina, Annie Haslam, Candice Night, Steve Stevens, Patrick Moraz and more, just that list is worth the price of admission. Sherwood and drummer Jay Schellen are the two guys present on all the songs, with the cast changing from track to track beyond that. While a lot of this is quite faithful, some of the tracks make interesting turns and changes from the original source material. The set is rounded out with two bonus tracks that both feature Squire. I previously reviewed those tracks on other sets, so for the sake of consistency my track reviews for those have been modified for use from the original reviews. I have to think that Squire himself would love this album. It really is a fitting and loving tribute to the man and his music. Billy Sherwood nails Squire's unique bass sound as they move off into this Yes song. I've always felt this was a too often overlooked number from the band. It has some amazing bass and guitar work, really. This rendition is very faithful. Jon Davison pulls off the vocals with style, and Patrick Moraz' performance manages to sound very much like Rick Wakeman's performance on the track, while also having some of his own sound. Interestingly enough, not only does Sherwood do an incredible job of replicating Squire's sound here, he pulls off the Steve Howe guitar parts so well, too. There is a short section of the track that does feel like a departure from the original Yes material, but overall this really is the definition of a tribute, just allowing the sound to really shine. Coming in quite true to the original song, the sound and groove on this is captured so well. Again Sherwood provides both bass and guitar. Steve Hogarth does a solid job on the vocals, but that part does provide the biggest change from the original. I dig Larry Fast's performance, too. It manages to bring some new flavors while still paying tribute to the original track. The bass work on this is purely amazing, but that's just as much a factor of Squire's original songwriting and playing as it is Sherwood mastery. Other than Jay Schellen's drum work and Annie Haslam's vocals, everything here is performed by Sherwood. The arrangement is the biggest change we've heard so far. It's more symphonic in terms of texture. Haslam's voice lends so much magic. While the piece is quite different from the original, it captures so much of the spirit and beauty of the original. This is my favorite Yes song, and this version really does it justice. While Dave Sancious provides the piano, Steve Stevens handles the guitar and Schellen mans the drum-kit, Sherwood handles everything else on his own. It's really a tribute to his skill that this piece is such an incredible rendition. Sancious does take the piano solo section a bit toward the jazz end of things mid-track. The closing section takes on more of the live arrangement of the piece, and that groove, than the studio rendition. When a piece is as much a trademark of an individual as "The Fish" was for Squire, how do you perform it as a tribute and have it feel right? I'd say that Sherwood has figured that out. He changes the general tone and concept of the piece, while still maintaining so many of Squire's original riffs. The result is a performance that builds on the inspiration of the original without simply copying it. There is more of a modern edge to this, but it still preserves so much of the original magic. Sonja Kristina's vocal opens it, with the instruments taking over from there. They return near the end to carry the number forward. I think The Fish himself would have loved this version. The vocals also end the number. Here Sherwood and company turn their attention to the first song that Sherwood and Squire wrote together. The opening section is quite a big change from the version that appeared on the Union album. As it works out to the song proper it starts to more closely resemble that original take. Steve Hackett's guitar works its magic while Steve Porcaro handles the keyboards. I've always felt this track was such a powerful song, and that vitality and beauty lives on in this version. Another cut that was always a real bass showcase, they bring this Yes number in with a lot of power and passion. It's a killer tune, and they really do it justice. Tony Kaye really shines in some of the latter portions of this cut. I've seen Yes live so many times that it sometimes the different renditions of tracks sort of merge in my head as kind of conglomerate when I think about the song. I've always really liked the arrangement of this track that was done on the Union tour, though. This feels to me quite a bit like that rendition. I'd consider it pretty faithful to that take on the track, which was a bit of a departure from the studio version. They put in a cool rocking groove on this take of the classic Yes song. Todd Rundgren's vocals work well here. While this track has lost a lot of its freshness for me from hearing it so many times over the years, I dig this rendition quite a bit. The mellower movement mid-track gets a little bit of a new texture. I love the meaty guitar sound on this rendition of the classic tune. Candice Night really nails this one, too. The overall sound on this is very faithful to the original version, but Brian Auger's organ heavy keyboard performance brings a different flavor at times. With a mellow and rather spacey introduction, this powers into some trademark Billy Sherwood stuff as it moves forward. There are some particularly powerful moments here. The cut has some killer guitar work, and the whole piece is just packed full of prog rock goodness. Chris Squire plays double duty on this rendition of the Pink Floyd song, delivering both the bass and lead vocals, while the other half of the Yes rhythm section Alan White helps him hold it down. Jordan Berliant provides acoustic guitar, and Sherwood handles the remaining guitars, vocals and keys. This one really feels a lot like it would if Yes were to take a turn at this number. It really works very well. Squire's vocal outro is very cool. Always a great song, this one is truly amazing here.